The user-friendly design of mySA.com/realestate features powerful online tools that introduce your homes and neighborhoods to more readers ready to buy. mySA lets visitors tour your listed homes without ever leaving their desks. They can research neighborhoods, calculate their mortgages and meet you as educated buyers who are ready to move. Plus, mySA reaches a quality audience — college-educated consumers who want to buy a home within the next 12 months. The San Antonio Express-News is still the first source for people looking for a new home, searching for new investment property or relocating to the area. With a Sunday readership of 525,676, your presence in our Sunday Real Estate section will capture the attention of a broad audience. The Sunday Real Estate section covers a wide variety of topics, including tips and information on buying and selling a home, builder and Realtor profiles, home décor, new construction, new communities, columns from the Greater San Antonio Builders Association and San Antonio Board of Realtors, area home sales statistics, open houses, builder communities, and more. Advertorial opportunities offer a platform for builders, Realtors, and businesses to tell their story in an article-type format. Need something a little out of the box or custom-tailored to very specific needs? From custom-responsive website design to integrated paid search campaigns, we can help build the right campaign to achieve your business goals. "Hearst Texas has been an integral part in getting our marketing efforts off of the ground. Hearst Texas is top-notch for not only the newspaper, but also SEO, SEM, and Digital. They are so integrated within the community that they know what is successful and therefore know how to take you to the next level. Hearst Texas has helped us increase web traffic, directed customers to us through various online marketing efforts and has given us an online presence that we previously didn't have, and overall helped “brand” our company. Luci Condra and Courtney Eberts have been amazing to work with. They continually follow-up to make sure we are happy with our results and help us strategize to improve year after year continually." Luci Condra is a Real Estate Account Executive with over 30 years’ experience and knowledge assisting builders, developers, and real estate agents. 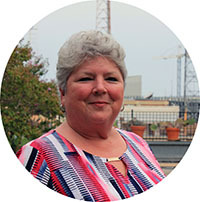 She is a member of and actively involved in the Greater San Antonio Builders Association and the San Antonio Board of Realtors.